Consumers want an issue to be solved. And the competition for a consumer’s order is winner takes all. 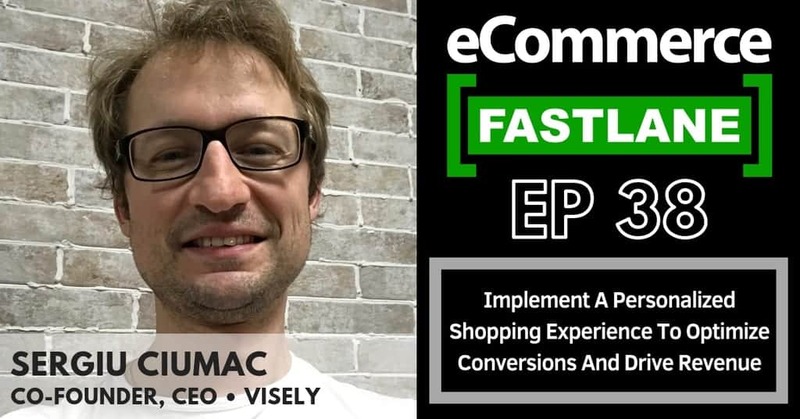 This means that out of the hundreds of vendors in a niche that only one store receives the almighty conversion, the rest are left with empty carts. 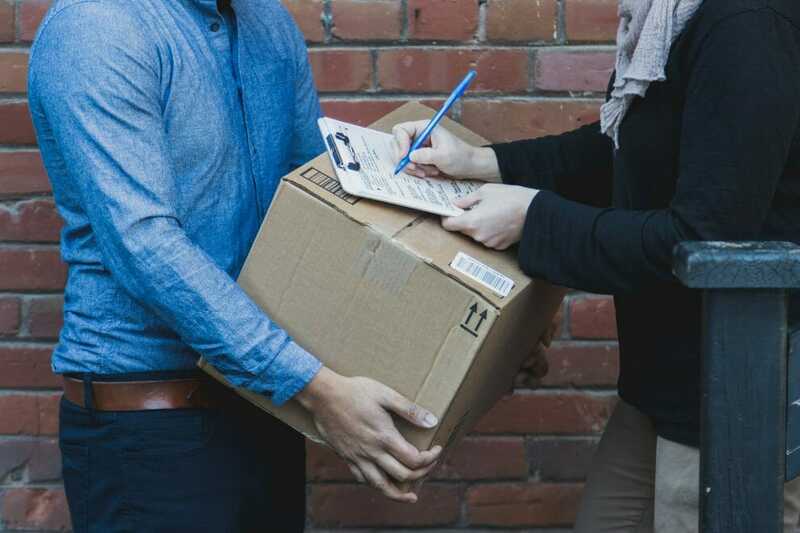 Direct-to-Consumer brands want to connect, surprise, directly with their consumers and as quickly as possible. 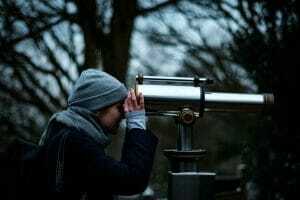 Their emphasis on the first interaction being digital means they need to be front and center whenever the consumer starts searching the web for answers. So let’s discuss how brands can win a new batch of consumers with questions. There is social media (Instagram, Facebook, Twitter, etc.) but unless said consumer is in the engaged community these platforms will not be the first place searched. There is paid media, but this comes with a high price tag and gamble on who is ready to have what question answered. Then there is pure good old-fashioned content. 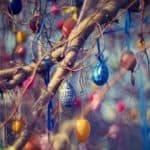 In most marketing worlds, blog content and Search Engine Optimization (SEO) are front and center strategies. However, the eCommerce world often neglects this strategy. 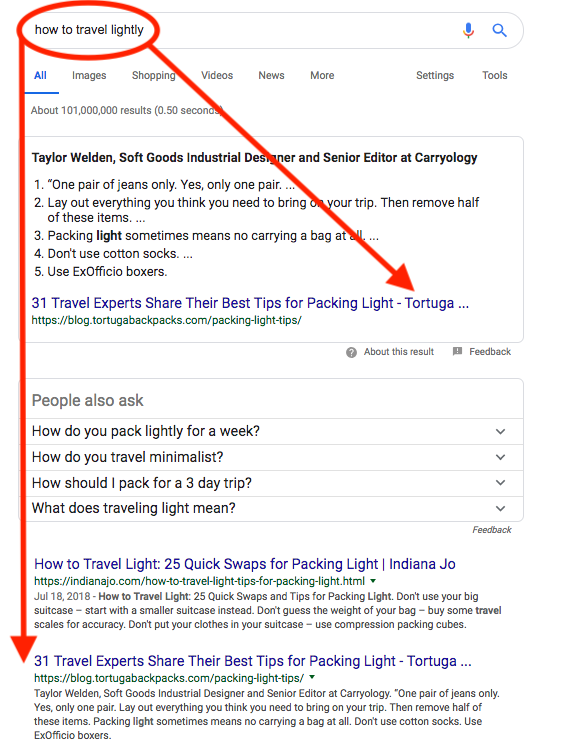 And to be clear optimizing product pages do not count since it is almost impossible to truly differentiate from the thousands of similar products with a minimal amount of text. 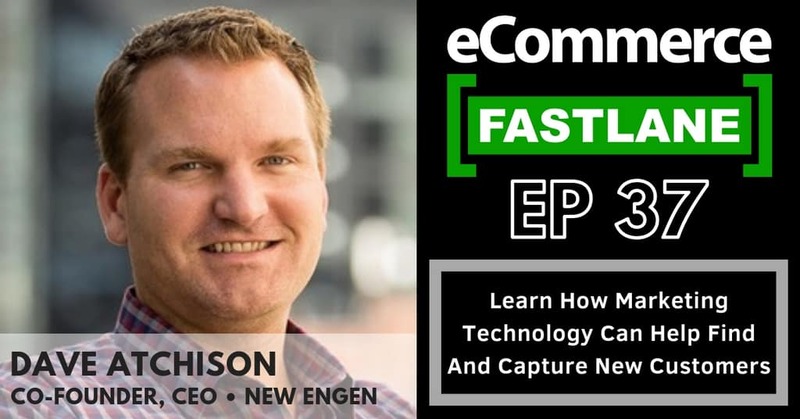 The next wave of eCommerce leaders will be information leaders. 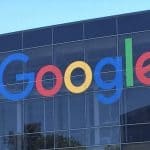 They will use informative, targeted content to gain new traffic, rank higher on search engines, build product knowledge, and ultimately forge a long-term relationship with each customer. People want problems solved and questions answered, and if you can sincerely do this in the first interaction they will begin to view you not as a faceless transaction but as a trusted friend. 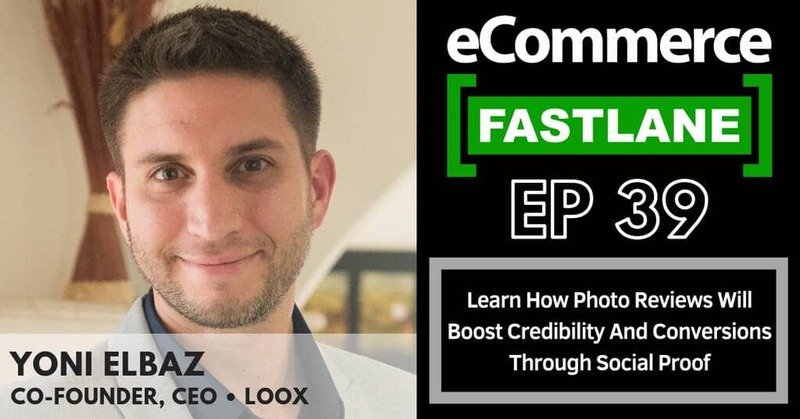 Since over 40 percent of revenue is captured by organic traffic industry-wide, there is a reason top eCommerce brands are continuing to dominate their respective markets. The Honest Company was founded by Jessica Alba and is a transparent baby and beauty store that brings innovative formulas and thoughtful designs to all of our beauty and baby products. 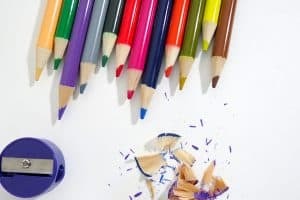 They use their blog to serve informative content about their products, but this has mainly served as a massive customer funnel for their products. 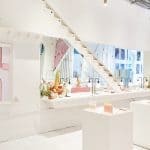 The Honest Company has become a library for those wanting to mix chemical and product knowledge for household products and is beating some serious health publications in the SEO game. Hims is a one-stop shop for men’s wellness and personal care, providing medical grade solutions for men’s hair loss, ED, skin care, and more. 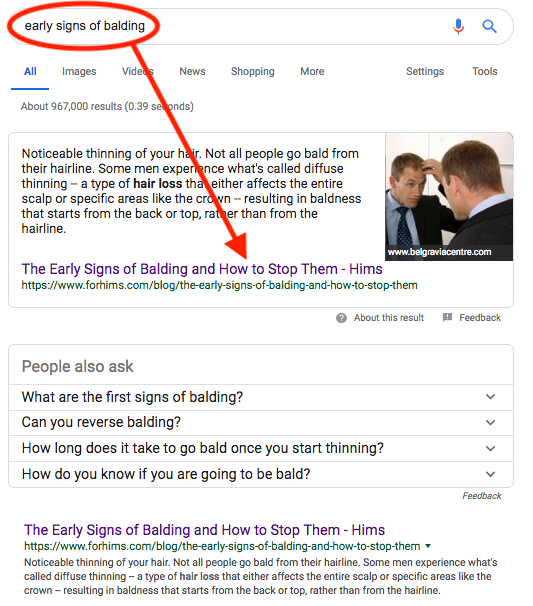 Note: The parent term ‘balding’ yields 16,000 monthly searches. 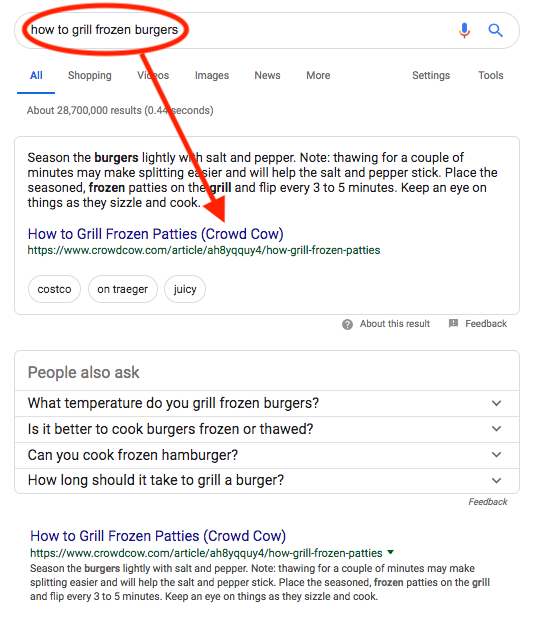 Hims owns the top two results. We love hims because of their detailed approach to solving these stressful personal issues. Instead of pushing visitors to a product promising a cure, hims content team takes the time to educate the customer on how to prevent these issues in the first place. Tortuga Backpacks is a luggage company that melds aspects of hiking backpacks with a design that’s optimized for international travel. Content has been king and queen for Tortuga over the years. Their subjects tend to be travel strategy and logistics with Tortuga backpacks sprinkled throughout the posts. BeardBrand is a men’s grooming company based that sells products for grooming and styling beards and mustaches. 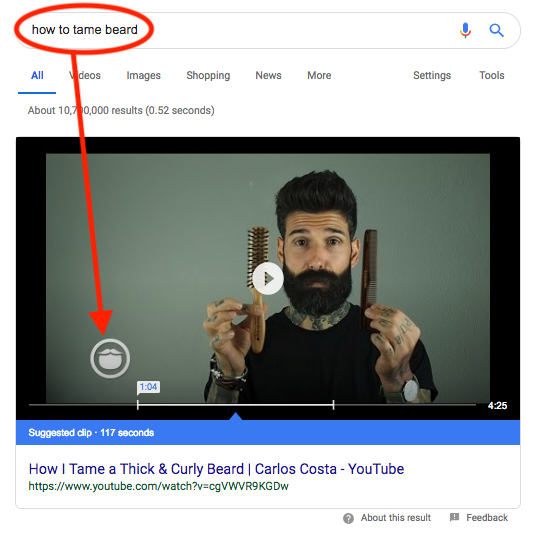 Note: The term ‘beard care’ yields 15,000 monthly searches, and BeardBrand also contains the top video tutorial and second search result. When you need to take care of your beard you watch yourself in the mirror, so BeardBrand made sure curious facial hair caretakers were going to watch a tutorial before any further scrolling. Rothy’s sells shoes made from recycled water bottles. 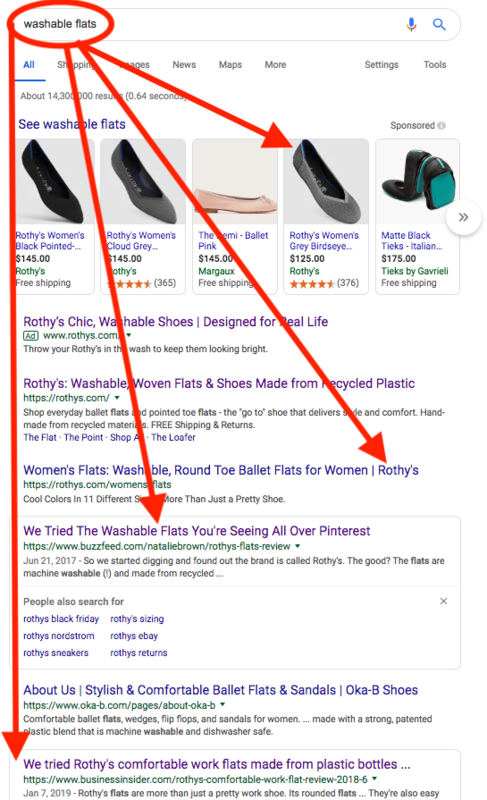 Note: Rothy’s also is the first search result for ‘washable shoes’. Shoes get dirty. People need to clean their dirty shoes. No one knows how to properly clean shoes. Rothy’s takes the lion’s share of traffic of people that simply want to throw their shoes in the washing machine like every other article of clothing. 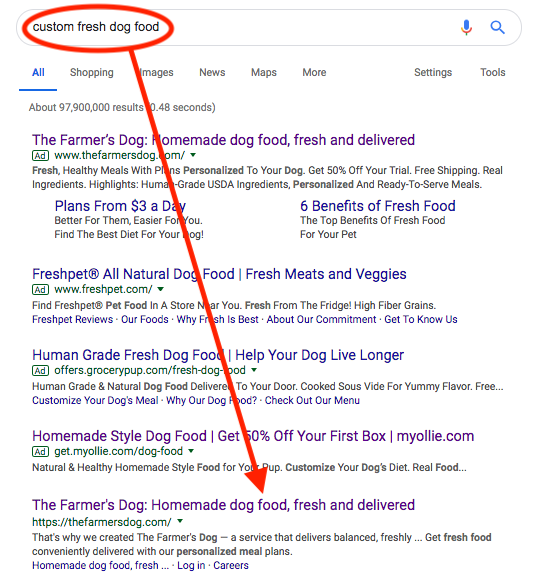 While this example isn’t blog content, The Farmer’s Dog is still picking up the number one search result in a crowded market with excellent keywords. Gwynnie Bee is an online clothing subscription service that allows women to access an unlimited wardrobe for plus-size individuals. At this point, we have heard claims for every industry that they are “Uber for this” or “Uber for that”. Well, Netflix’s business model has become popular enough to own its own comparison search inquiries. 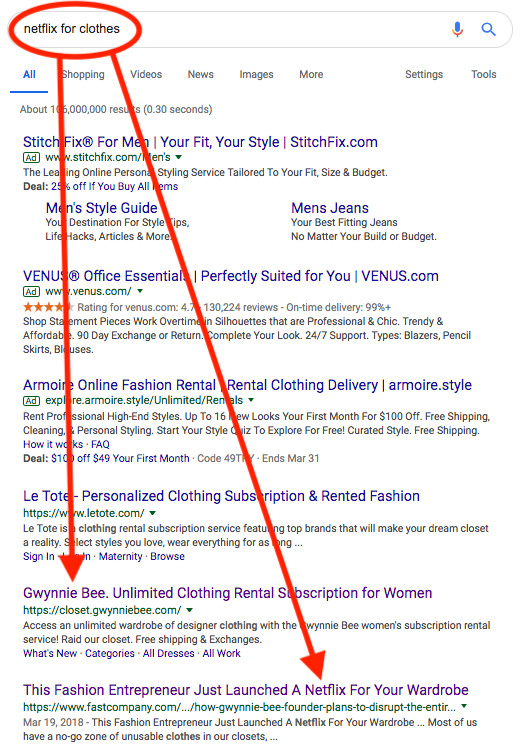 There might not be nothing more you rotate than your clothes, so Gwynnie Bee lets consumers know they will handle the catalog from here. MeUndies brings together sustainable fabric and amazing design to make the ultimate softer-than-soft, feel good underwear and apparel. Note: The term ‘matching underwear’ yields 2,000 monthly searches. 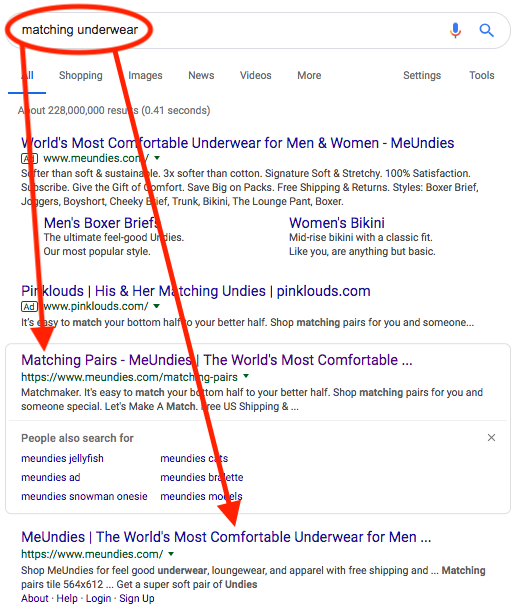 This search exists, and MeUndies is controlling all the eyes of those couples looking to take this brave next step in the relationship. Crowd Cow operates a platform that enables customers to buy beef directly from small family farms. It sells whole cows from small ranchers divided into manageable orders; and cuts of chicken, pork, and olive wagyu. Littered across Crowd Cow’s website is education on the how food should be sourced, prepared, and devoured. They write about industry trends and mishaps, and get down to instructional articles for specific items such as above. Crowd Cow will quickly become the company you’ll want to break bread with over time. Crane & Canopy is an online bedding company dedicated to bringing you chic bedding, bath, and decor at the right price. 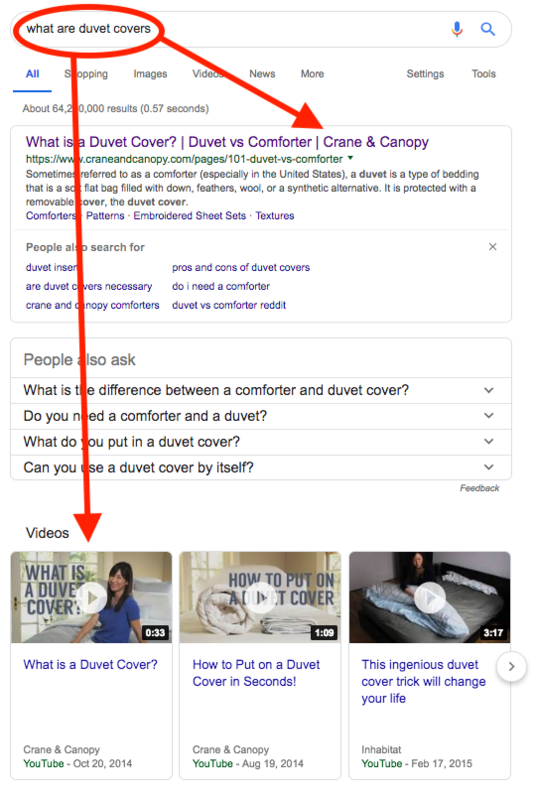 Note: ‘what are duvet covers’ yields 1,800 monthly searches and ‘what is a duvet cover’ yields 30,000 monthly searches. Crane & Canopy rank number one for both. In the overcrowded bedding industry, Crane & Canopy gets to inquiries first on almost every topic that could be considered research. Explanations and instructions fill their articles with their product being the centerpiece to the purchasing guide. Nisolo offers handcrafted footwear and accessories for men and women. 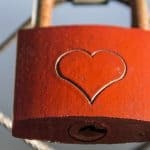 Addressing real, physical pain can earn customer loyalty much faster than wanderlust social media posts. Nisolo earns the first click on someone not interested in sourcing the entire web. Desert Farms brings the healthy tradition of camel milk to the United States with fresh, sweet-tasting milk from happy camels in our farmers’ green pastures. 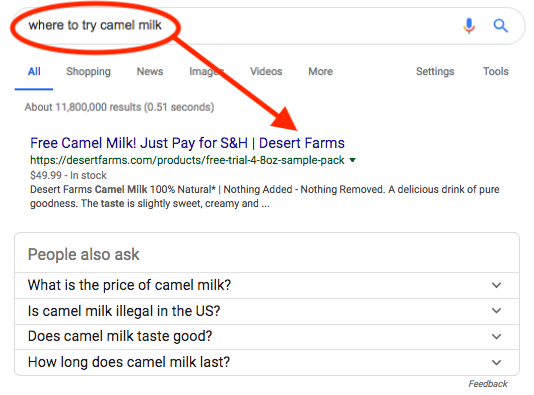 Note: Desert Farms is also the first search result for the parent term ‘camel milk’, which yields 15,000 monthly searches. This list would not be complete without the impressive cornering of the camel milk curiosity market that Desert Farms has accomplished. 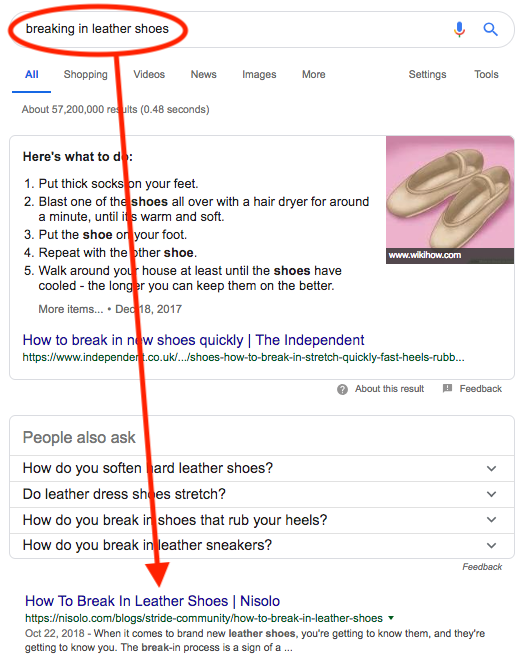 A large portion of search is matching unique consumer’s search intent. No longer does a consumer head to the web and type in ‘hats’, they need hats for specific occasions, or to address specific concerns. 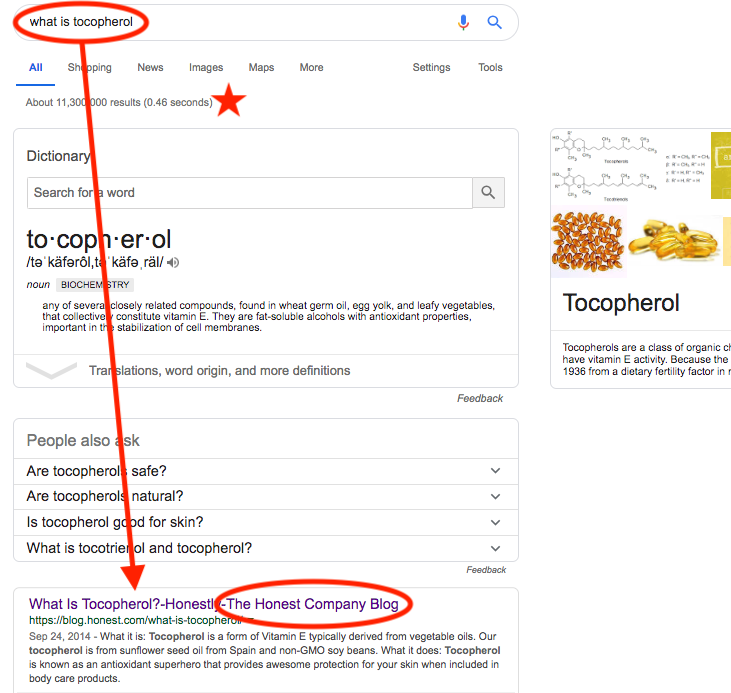 And Google and other search engines are starting to push more informational content above product pages. 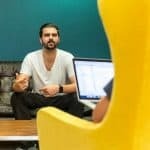 Content marketing and SEO have the ability to scale – every thoughtful article will hold a lasting value for your brand in terms of web real estate, referral traffic, and domain authority. Give consumers what they want. Direct intent can be a direct transaction for your store. This article was originally published by our friends at Yaguara.